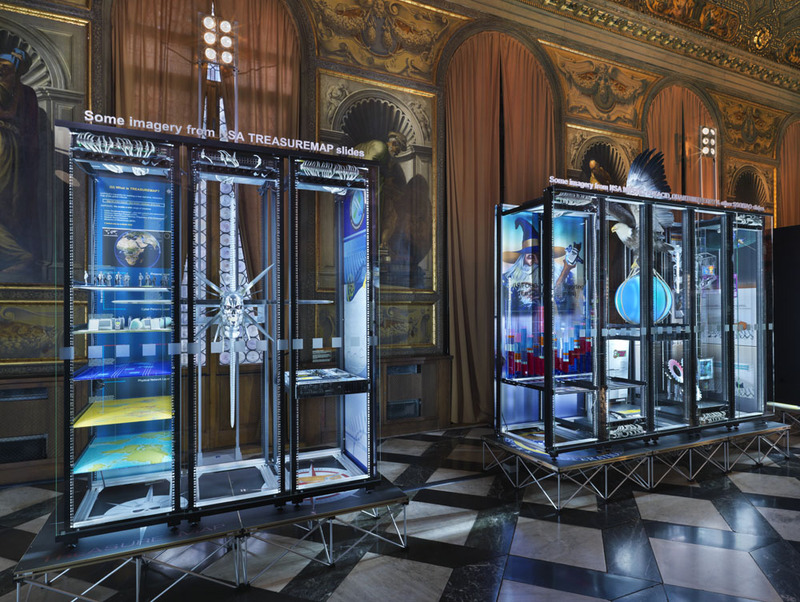 Simon Denny’s “Secret Power” exhibition; image courtesy of the artist. 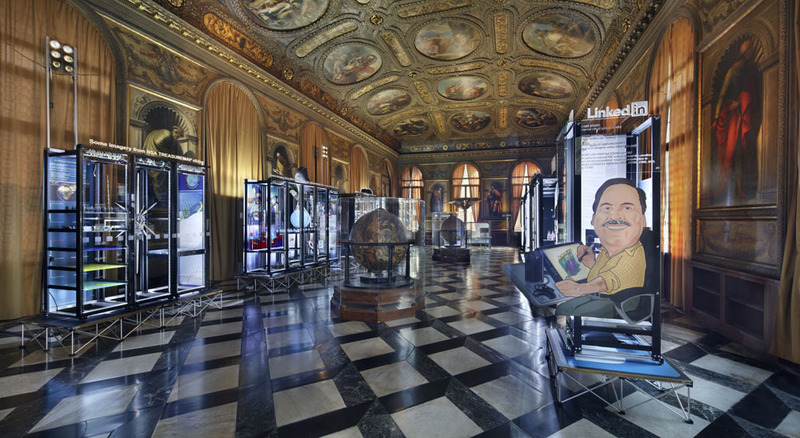 At this year’s Venice Biennale, one of the most important contemporary art exhibitions in the world, artist Simon Denny used the New Zealand Pavilion as a platform to investigate the visual language of America’s National Security Agency. He commissioned a design from a former graphic designer and art director at the NSA, David Darchicourt, to illustrate various security-based themes… without telling him of their intended use. The Guardian broke the story and informed Darchicourt that the images were used for Denny’s “Secret Power” exhibition (pictured above courtesy of artnews.com) along with leaked NSA graphics designed while Darchicourt was a member of the agency’s art department. Denny’s deception added another layer of intrigue to an artwork about the culture of knowledge and secrecy. We asked him why NSA aesthetics matter and how his conversation with the NSA cartoonist went after the leak. A.J. Samuels: What’s frightening or interesting to you about the images connected with the NSA slides Snowden leaked? Simon Denny: When I saw the slides for the first time I was maybe as surprised and confused about their content as many people were. But I was also very taken by the way the information was presented. The graphics, logos, layouts and logic of which phrases and images were used seemed as revealing about the culture behind agencies such as the NSA as the text information they contained. I saw particular languages and subcultures being drawn from—fantasy, pop-sci-fi, gaming, magic and wizardry—which I didn’t necessarily associate with the bureaucratic and technical languages of intelligence agencies of major nation states. For example, images were lifted from Magic: The Gathering-style game Shadowfist for slides describing QUANTUM, which is an NSA attack program that duplicates Internet traffic; there were references to the Terminator series and Skynet in the TREASUREMAP Internet mapping program; popular meme lolcats were used to represent the QUANTUMSQUIRREL program and representations of wizards showed up as icons for the phone-tapping program MYSTIC. And there are many more. You’ve said of the NSA’s images that “the leak made them into 21st-century masterpieces.” In what way? The images that Darchicourt and his contemporaries have created read as icons for the activities that have become so debated, which makes them extremely important cultural producers. They have provided easy visual handles or shorthand summaries to very abstract, complex programs that maybe only one or two technical specialists know the workings of. 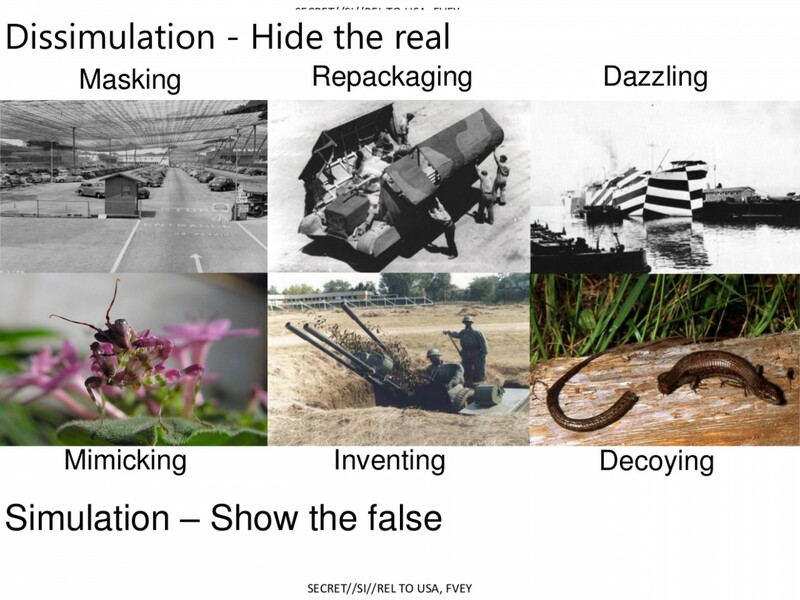 So you think the images from NSA slides aren’t just primitive visualizations? Actually, they’re highly sophisticated. I think the set of cultural referents—including military history and use of illusionists such as Teller of Penn & Teller in GCHQ’s [British Intelligence’s] Art of Deception slides [which revealed tactics governmental agencies are using to “control, infiltrate, manipulate and warp online discourse”]—shows a complex understanding of the cultural space around this material. I can only speculate, but building these kinds of references into imagery could suggest playfully boasting about their badass capabilities. Or perhaps they suggest a degree of criticality, using a symbol as potent as The Terminator to introduce a critical possibility into icon making. A frame from the GCHQ slideshow “The Art of Deception” courtesy of edwardsnowden.com. Do you consider your installation a work of “reverse espionage” as The Guardian stated? Not exactly. I think it was a very clever and effective headline. The fact that the paper “leaked” the details of my mildly covert project was very appropriate and made for a better artwork. Darchicourt eventually emailed my collaborator, designer David Bennewith, saying he had questions about the project and requested a phone conversation. Over the phone with Darchicourt, I explained what my intentions were with interpreting his material without permission. I also offered to host him in Venice. Actually, once the gesture was performed of making and releasing the exhibition without his knowledge, I felt like his close input would add even more value to what was presented. He indicated that he would have to consult the NSA before he could accept any further invitations from me. Unfortunately I haven’t heard from him since.